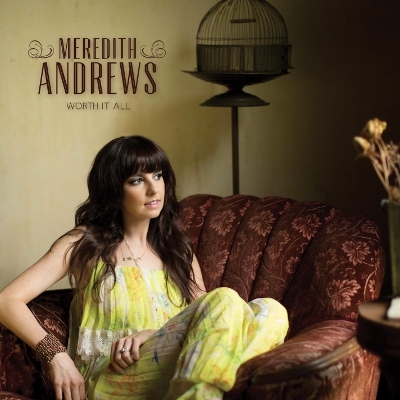 Meredith Andrews has released her new eleven track album titled 'Worth It All', produced by Paul Mabury (One Sonic Society, Hillsong). Meredith released her debut album 'The Invitation' in 2008, receiving recognition as Billboard Magazine's 'Most Promising New Artist'. In 2011 she picked up two Dove Awards for Worship Song of the Year and Praise and Worship Album of the Year for her second album 'As Long As It Takes'. Read More Meredith Andrews has released her new eleven track album titled 'Worth It All', produced by Paul Mabury (One Sonic Society, Hillsong). Meredith released her debut album 'The Invitation' in 2008, receiving recognition as Billboard Magazine's 'Most Promising New Artist'. In 2011 she picked up two Dove Awards for Worship Song of the Year and Praise and Worship Album of the Year for her second album 'As Long As It Takes'. First track 'Open Up The Heavens' is a song about asking God to pour out His love from heaven. This upbeat opener is a great start to the album. The style of music on this album has that modern pop/rock feel to it. It isn't necessarily anything new in regards to the style of music, but there is so much more to this album than that. What I enjoyed more than anything on this album was the quality of the songs. 'Not For A Moment [After All]' has a great melody that makes the song itself a stand out moment of the album. But it's during the track 'Strong God' that you fully appreciate the beautiful vocals of Meredith. This lady can sing. The tone and quality of her voice is brilliant, complimenting the song very well. As with some albums, it takes time to really appreciate the quality of the album, and this album took me a few listens to really get it. But once you understand what Meredith is trying to convey to the listener on this album, you can not help but enjoy worshiping God with tracks like 'Burn Away', and there are many more like this on the album. 'Worth It All' is a great worship album, full of songs with great melodies. But what really stood out for me was the fact that Meredith knows how to use her voice to glorify God, and on this album she does this amazingly well.